The Upper Arkansas River Valley is nestled at the base of over a dozen 14,000+ ft. mountain peaks. As a result, the swift water has, over eons, cut scenic canyons into the bedrock, and created some of the “best” whitewater rafting in Colorado. Most of Geo’s Arkansas River Raft Trips launch in/near Buena Vista, Colorado. Many guests choose to ride with Geo Tours, from the Denver area, for a small surcharge and, let us do the driving! 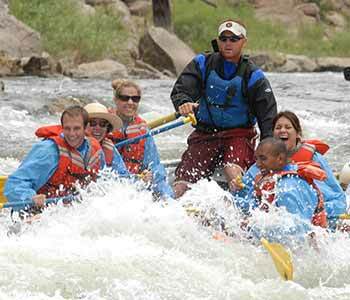 Geo Tours has been outfitting Arkansas River Rafting Trips since the early 1980’s and, offers One-Day, Overnight and Two-Day expeditions on this way cool river. Let us customize the perfect trip on the Arkansas River for your whole group’s technical ability and, take advantage of Geo Tours whitewater rafting expertise. Meals, rafting equipment, spray jackets and most importantly, guides, are include in your price. Wetsuits and boots are available for rent as well as camping gear for Overnight excursions. Call us for more information! Brown’s Canyon has recently been named one of America’s newest National Monuments! This run is a whitewater classic with rapids such as Zoom Flume, Pinball, Staircase, Widow Maker and Raft Ripper and one of Geo’s most popular trips. Your heart will pound as your raft careens through narrow boulder-filled rapids, while calm stretches of the river afford spectacular views of the Collegiate Peaks. 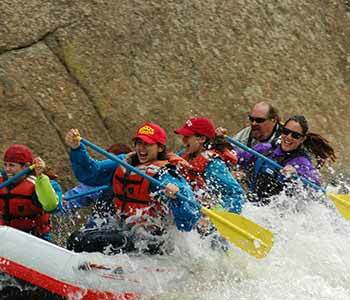 This trip is a less crowded alternative for those who have already mastered the Arkansas River. As you navigate some of the narrowest portions of the Upper Arkansas River, Frog Rock and House Rock rapids will challenge you to a test of survival. The Narrows can be combined with Brown’s Canyon into a Two-Day outing. Previous rafting experience may be required (including a swim test).